The picture you’re looking at is of an iPad 2 floating high enough into space to see the curvature of the Earth, far above the Nevada desert. Guess what is going to happen next? 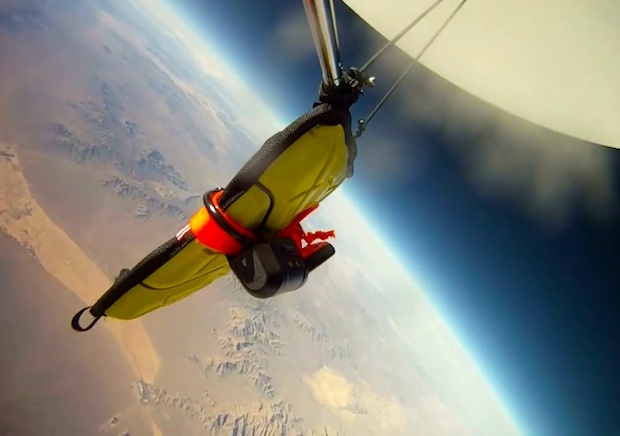 Using a weather balloon, G-Form sent an iPad 2 enclosed in their new Extreme Edge case over 100,000′ into the stratosphere. Attached to the iPad was a GoPro camera to film the entire thing, from ascent including the bursting of it’s carrier ballon and the resulting harsh landing in the middle of rocky nowhere. Amazingly enough, the iPad still works just fine after crash landing to Earth. I think it’s fair to say that G-Form cases win the toughness award, not bad for $45. G-Form always comes up with some creative ways to market their ultra-protective cases, first they tossed an iPad out of a plane, but now they’ve really outdone themselves. Even if you don’t have any plans to buy an impact protective case for your gear, these videos are fun to watch. thats impressive, no matter what, but just bringing it to new heights doesn’t do anything after so many thousand feet. terminal velocity on an ipad laying flat is probably reached very quickly and it will never fall more quickly than that. i’d like to see it fall on its edge. So what is being used to protect the camera that films the whole process. Or sorry for my ignorance about the camera itself. I’m just as impressed in the GoPro cameras ability to survive a big fall than anything else. As Tyler mentioned though, both pieces of hardware will hit terminal velocity after about 100′ so anything greater isn’t going to matter. Great marketing stunt though and it’s nice to see space from time to time. Is that the curvature of the Earth or just the camera’s fisheye effect? Nice. But will it survive being handled by my three-year old? Now there’s the real test. And what should that demonstrate?? Wonder what would happen if the glass face hit the rocks? Cool but agree with other comments and wonder how many times they had to do it before it “worked”?? That’s good, because the title is “iPad Survives Fall of 100,000 Feet” and yes G-Form makes cases for Kindle too. I think this is more a demonstration of the iPad’s ability to handle extreme temperature changes. Also, the iPad landed on its back. If it had landed face down things would have been different. Is the case designed to land so that the back is down. If so, what height is needed to accomplish this feat? I call me to take the stand. So I can just drop my iPad from about ten stories up and see what happens. That sounds so much easier. I don’t even have a weather balloon. Great video, but why did you cut the fall?! You should’ve sped it up, I tuned in to see an iPad and goPro fall from space, not to see you looking for it afterwards! That’s a real shame.